play the Roxy, London tonight. The Drones (pictured left) are the latest punk outfit from Manchester treading the boards in London. They formed at end of 1976 and the line-up is: M.J. Drone (vocals), Gus Callender (guitar), Steve Cundell (bass), Pete Howells (drums). suicide by throwing himself in front of a train in London. The Ousiders are a buzzsaw punk trio from Wimbledon, London making their debut at the Roxy, one of many support slots in the coming year. Formed in 1976 by Adrian Borland on guitar/Vocals with bassist Graham Green, and drummer Michael Dudley. They're managed by Ades mom Win! The Sneakers were Leeds, UK's first punk band. They play Leeds Stagepost Tonight. The Sneakers had on rhythm guitar a geezer called Barry Lights. 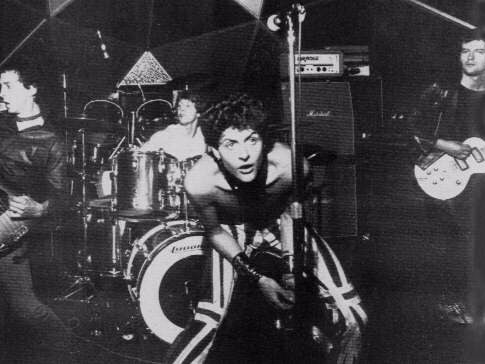 Barry Lights who went onto infamy and rip-off status as the head of early 80's UK punk label Beat The System records which hosted bands like The Fits, External Menace and One Way System.